I saw an article recently on Facebook which lamented how moms “lose a part of themselves” once they become a mother, basically due to the major shift in having to account for and incorporate a child into all of life’s plans versus just accounting for yourself. Several women identified with that feeling, maybe you did/do, too. I want to give some credence to this concept because becoming a parent is a big shock to the system. You get a baby, of course, but you don’t get to sleep or eat or go out, etc., whenever you want to. Maybe you don’t shower for days at a time. Maybe, like me, you had a “postpartum uniform” consisting of the same pair of sweat pants and a breastfeeding tank top. Also, a big robe that I’d throw on for chilly nights or special occasions like company popping over. Just ask Matt. I wore my postpartum uniform for a solid four months, maybe more. The transition can be jarring. That said, I don’t relate to the “lost myself” post for a few reasons. First, I think the whole idea is moot if we stop to consider the fact that not only have we not actually lost any of ourselves, God has miraculously taken pieces of us and multiplied them. Second, feeling lost was not my experience at all. Motherhood is where I found myself. More on that in a sec. Third, and what I want to dissect more than the other two, if you are in Christ, who cares if you lose yourself? Isn’t it kind of the point of following Jesus to lose yourself to find him? To peel back our layers of self-centeredness until we can see only Jesus at our core? Before I was a mother, I had my faith and my values; they became the foundation for which I lived my life. Things were real and rich and good, yes, but they were also kind of fluid. I was responsible for myself and only myself. I could, if I wanted to, change my mind from day to day about what I believe and being fickle would have had little impact on anyone except for maybe me. When we had Harper, figuring out what I core-believe hit me like a ton of bricks. A wave washed over me when I started parenting. A wave of identity and intentionality. It’s one thing to live your life in a state of total personal impressionability, but when I became a mom it was an immediate and important goal of mine to provide stability, consistency, and dependability to a future generation. I have totally “lost myself” over the last six years in the sense that 2015 Laura is very unlike 2009 Laura. I happen to feel like whatever of me I “lost” was made up for (times ten) in what I have gained through a grander knowledge of God and through finding my identity in Him as I fight the selfishness I’m prone to in order to show Jesus to my family. If I lose myself in becoming a parent, that’s a small price to pay in order to find God. Consider this: Matthew 16.24-26 “24 Then Jesus said to his disciples, “If any of you wants to be my follower, you must turn from your selfish ways, take up your cross, and follow me. 25 If you try to hang on to your life, you will lose it. But if you give up your life for my sake, you will save it. 26 And what do you benefit if you gain the whole world but lose your own soul? Is anything worth more than your soul?”. Self-centeredness and self-absorption are things I believe that every human struggles with. We all want to feel important, we all want to be heard, we all want to be well-liked and respected. We worry about our bodies, our social standing, our bank accounts. We all think other people are way more interested in us than they actually are. Selfies are a thing, need I say more? And now we have these megaphones of social media where something we say or show can reach hundreds – maybe thousands – of people in only minutes. Now listen to how sad this is: What do we use these platforms for? We use our platforms to elevate and showcase ourselves instead of God. Try scrolling through your posts to see for yourself who or what you are prone to elevate…I was convicted, maybe you will be, too. I say “Look at me” much too often when I should be saying “Look at God” or even “Look at God in me.” I use pictures or words to subtly communicate, “I am healthy. I am good. I am smart. I am together. I am successful. I am…”. This is so convicting because I am not I AM. But I sure put myself on a pedestal like I AM. So, this is where losing yourself and finding yourself merge together. Whoever we are or were or whatever – doesn’t matter. Let’s stop trying to hold on so tightly to that person. We have to work hard to change our patterns of behavior in order to elevate God over self; if we do not proactively seek to lose ourselves to find our identities in Christ, we will always default to serving ourselves. What we CAN do is soul search. Pray and read and listen to what God has to say about the identity He wants us to have (hint: it’s going to look like Jesus). It’s very good to be intentional and have direction. Write down and memorize a personal or family mission statement. Here’s a clip of Cortland saying ours. 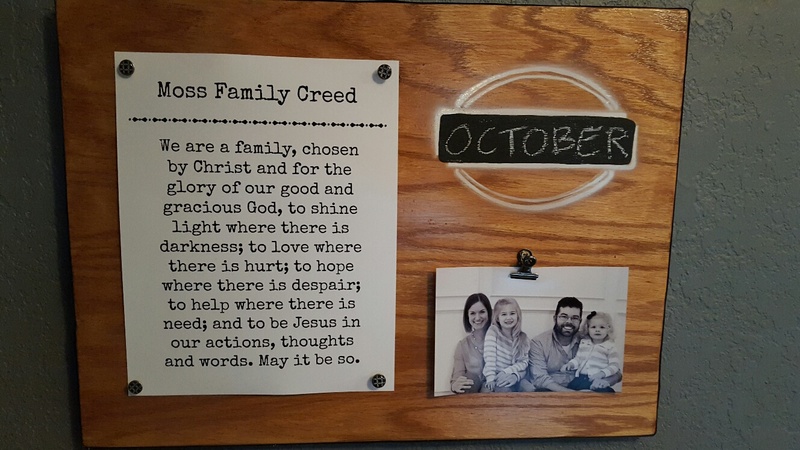 Matt and I pray that our Family Creed will help us focus and re-focus as many times as our culture encourages us to think first and most often about ourselves. One other quick thing on our personal missions: I have friends who are doing incredible, selfless, mountain-moving kingdom work around the world. I used to get a little jittery when I would hear people talk about feeling called or led to a foreign country, because I’ve never felt that kind of burden and wondered if maybe my compassion-meter was broken. It was as if my belief was that we are ALL called to a foreign country if we’re connected enough to God or are spiritually mature enough to really hear and understand what He’s saying. This belief assumes that, if you’re not a “real” missionary somewhere impoverished, then you’re spinning your life’s wheels. If we dwell for too long in this pattern of thinking, our everyday life here will start to seem inconsequential. But have we pondered the plight of America lately? Our country’s poverty is not for lack of food or shelter or clothes…it’s our spiritual poverty and our level of depletion is crippling. Alarming. Devastating. My burden is for right here at home in the US and, oh boy, do I feel called. There is kingdom work EVERYWHERE here. Don’t be fooled by full bellies and trendy clothes and lots of degrees – people are drowning in wealth, but starving here. Right here. We can do this.